Estella's Revenge: First of 2014: The Weed That Strings the Hangman's Bag! First of 2014: The Weed That Strings the Hangman's Bag! Flavia, Flavia, Flavia! You're the perfect pick for my first book of 2014. 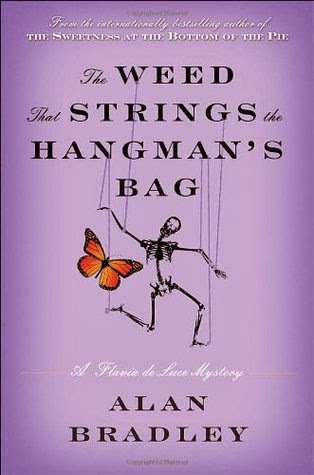 I finished The Weed That Strings the Hangman's Bag, by Alan Bradley, on January 4th, and I'm so glad I picked it up. In this installment of the series, Flavia deals with the mystery surrounding a little boy's death years before, a famous puppeteer, his wacky girlfriend, and the village idiot, Mad Meg. Not to mention the usual drama surrounding her father and sisters. Unlike The Sweetness at the Bottom of the Pie, it actually took a while to get around to the murder Flavia had to solve in this book. I'm not complaining at all, as we also get more of Flavia's passion for poisons, and some of characters I love best (Dogger!) are developed further. I also found this book even wittier than the first installment, which is saying a lot. There's no end of snappy retorts and dramatic conclusions. I love Alan Bradley's writing hard, and these characters are gold.